Oil pulling is the act of drawing toxins from the body through the gums using high quality natural oils that help to improve oral health and some claim even purify the blood. This extremely popular remedy was first written about in ancient Indian Ayurvedic scriptures dating back thousands of years. However, its popularity had died back to just a few remaining practitioners until recent years. The new surge in popularity in this traditional remedy is thanks in part to a number of celebrity endorsements from the likes of Gwyneth Paltrow and Shailene Woodley that helped to put this long forgotten treatment back under the spotlight. Well, there are a couple of options here but by far the most popular oil used is coconut oil. This saturated fat forms the perfect consistency and offers additional antibacterial, antiviral and antifungal properties to keep our teeth and gums clean and healthy. It is also one of the most neutral in taste and so is less offensive. Another oil that is popular for use with this treatment is sesame seed. This is one of the oldest oilseed crops known and was domesticated well over 3000 years ago. Shiny White Teeth - Before you go out and purchase your next load of expensive, yet toxic tooth whitening products you may want to consider giving oil pulling a try! Just two weeks of use can dramatically brighten your smile as well as remove nicotine stains from teeth and fight gum disease. Extra Energy - When our immune system is put to work clearing out toxic waste from the body, it can drain our energy levels. Regular oil pulling is known to help lighten the load on our immune system, helping to increase energy and fight fatigue. Full Body Detox - Research has shown that root canals and mercury fillings can often leak toxic agents that are then released into the bloodstream. The antibacterial and antifungal properties of oils like coconut and sesame can effectively remove toxins from the mouth that can often lead to infection, inflammation or disease when left untreated. Menopause Relief and Balancing Hormones - Women going through menopause and teenagers going through puberty have reported benefits in their symptoms by oil pulling. Tired of Headaches? - When the body is under toxic stress, headaches and migraines become much more common. It is nature's way of asking for some time out to recover. By reducing bacteria from the body via oil pulling the instances of headaches can be lessened. Fight Acne - Removing toxins from the body that would otherwise make it into the bloodstream can have a dramatic impact on the appearance of skin. Many people who regularly use oil pulling claim to have seen dramatic effects on their acne (and some other skin problems such as eczema and psoriasis)in a matter of weeks. Oral Hygiene - Oil pulling is highly effective at reducing tooth cavities. It also helps to reduce bad breath. Streptococcus bacteria (an important player in tooth decay) and other micro-organisms are easily removed by the antibacterial and swishing action of the coconut oil. 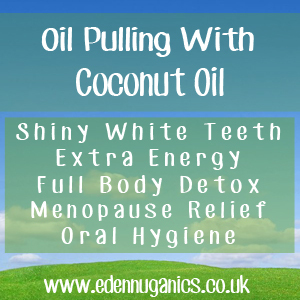 Oil pulling should be done first thing in the morning before eating or drinking and before brushing your teeth. Put 1 heaped teaspoon of coconut oil into your mouth. At first it will be solid, but will very quickly become liquid. Next, just swish the oil back and forth, around and between all of your teeth and gums until the oil turns from clear and thick to a thin, white, milky consistency. This takes a minimum of 15 minutes, preferably 20 minutes. Swallowing a little will not harm you, but repeatedly swallowing the oil after you've pulled it means you will be ingesting many of the toxins you intended to remove. Relaxing whilst doing it will reduce the urge to swallow. You can actually swallow easily whilst keeping the liquid to the front of the mouth. Start with a smaller amount and work up to 1 tspn if you are having trouble. Once done pulling, spit out the oil into a bin, avoid using the sink as it will turn solid again once cool and could block pipes. Why I am Obsessed with Oil Pulling.